A Galapagos cruise with Silversea Expeditions offers adventurous travelers who want to experience the life-enriching chance to discover a wild, pristine paradise that has long been regarded as a natural laboratory of evolution. 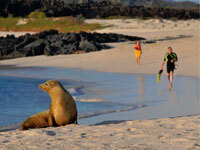 Guests can enjoy up-close encounters with an abundance of Galapagos wildlife. Join complimentary expeditions ashore guided by Silversea's experienced Expedition Team for the most authentic and enriching of experiences possible. Observe unique highland ecosystems, hike through lush mangrove forests and across volcanic fields, explore natural lava tunnels, watch for wild flamingos (in season), read cave inscriptions from the 1800s, and learn about conservation efforts at the Charles Darwin Research Station. Plus there will be many opportunities to swim and snorkel while learning more about the sealife found in the tranquil clear waters that surround the Galapagos Islands. But these exciting shoreside activities give only half the picture of your Silversea Expeditions experience. On board the luxurious Silver Galapagos, the elegant vessel of your Galapagos cruise you will find spacious, ocean-view accommodations, sumptuous gourmet cuisine, the personalized services of a butler, and a generous selection of all-inclusive shipboard amenities, such as complimentary beverages, wines and spirits served throughout the ship and stocked in your suite. Fares include onboard gratuities, with the exception of gratuities for Spa services. 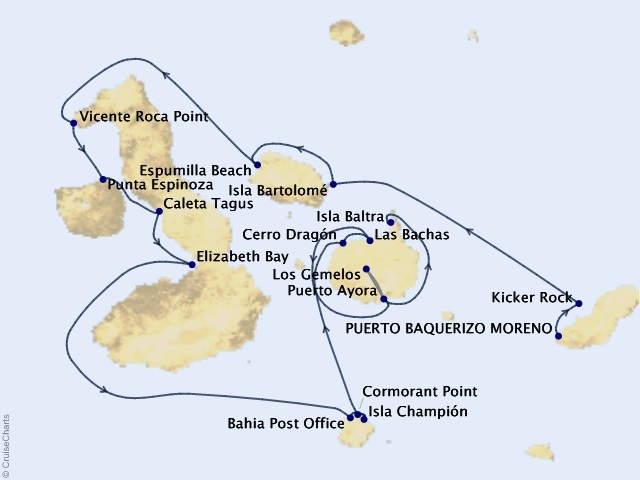 All Silver Galapagos accommodations have ocean views and all offer attentive butler service. Select suites even feature large private verandas or panoramic windows to take in even more of the stunning and diverse environment while onboard your luxury cruise. Every suite and stateroom includes a refrigerator and bar setup stocked with your beverage preferences, down duvets, the finest Pratesi linens, luxurious bath amenities, spa robes and slippers, on-demand movies and music. Please click on the appropriate deck below for more information. All Package Fares shown are per guest, based on double-occupancy. Fares are capacity controlled and subject to change at any time without notice. Availability of all suite categories cannot be guaranteed. Fares for single guests are available upon request. Additional restrictions may apply. All fares, savings, offers, itineraries and programs are subject to change without notice. Voyage highlights, excursions and Enrichment Programs shown are subject to change and/or cancellation without prior notice. Silversea reserves the right to correct any errors or omissions. Not combinable with any other promotional offer.